This file is a collection of activities and centers/centres to assist in developing the multiplication concept and learning the 2s, 5s and 10s times table facts. 1. Frog-tastic Groups – students make equal groups using frogs and lily pads. 2. Making Equal Groups (in color/colour and black and white) – students choose a card and make the groups with counters. Students draw and record the groups on the recording sheet. 3. Spin a Group – students spin the spinners, make the groups with manipulatives and record. 4. Spin an Array – students spin the spinners, make the array with manipulatives and record. 5. Repeated addition (in color/colour and black and white) – students match the repeated addition with the multiplication sentence. 6. Mitt Multiplication – match the glove (with multiplication sentence) with the ball (product). 7. 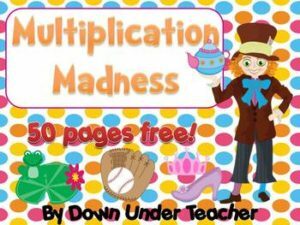 Multiplication Madness – match the Mad Hatters Hat with the tea pot. 8. Magical Multiplication – match the crown with the glass slipper. All recording sheets are included. I hope you enjoy this freebie! Please leave feedback and consider following my store to be updated when I post new products and freebies. For more freebies and ideas, you may like to follow my blog Down Under Teacher! Copyright 2012, Down Under Teacher. For single classroom use only. Please do not redistribute, edit, sell, or post this item or any part thereof on the Internet (even a personal/classroom website), although you are welcome to provide others with this TpT link so they can download the product for themselves.